For an instant slice of Croatia head to Hotel Marmont. Just like the country, it’s a captivating old world charmer loving dressed up in new age style. The views from the roof-top terrace span from the commanding St Duje`s Cathedral across the roof tops right down to the gleaming Adriatic alone make it all worth it. This ever so slightly elusive property is buried in Split’s Old Town, off Marmont Street, just north of the Riva and a stone’s throw from Diocletian’s Palace. Once you’ve uncovered this gem you’ll find yourself immersed in a labyrinth of passage ways. Simply see where you end up as you meander through cobbled streets, passing though teaming market squares and eventually make your way down to the glistening palm-fringed harbour which oozes that old world Croatian charm. The Marmont’s rooms are the epitome of old meets new. Envisage the bare stone walls dating back to the fifteenth century alongside a soothingly minimalist interior awash with tranquil white hues. Style and comfort personified, the perfect haven after a day’s exploring. Croatia is just one of those places that has it all, and Hotel Marmont is a real slice of this. Romantic medieval charm meets sumptuous modern elegance. Tucked away in Split’s warren of an old town you’ll be the first to discover some secret little café one minute and in a chic bar pulsating with night life the next. But then the Marmount has that covered as well. 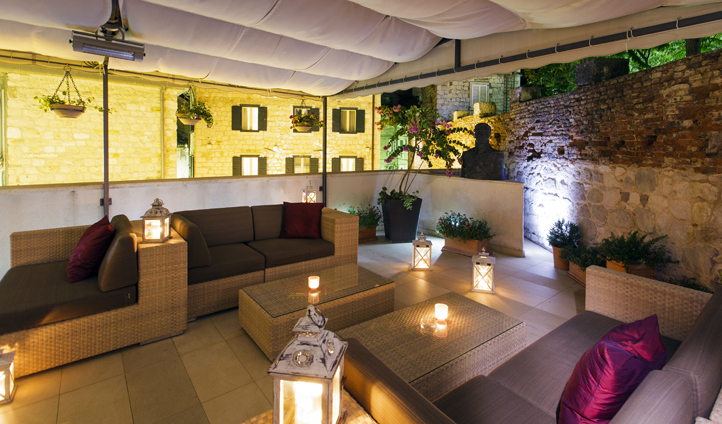 Retreat from the bustle of the Old Town to the roof terrace in time for dusk, grab that sundowner before you try out every camera setting to capture the falling Croatian sun over terracotta rooftops in all its glory.